This airticle is aboot the ceety. For the state, see Veracruz. Veracruz, offeecially kent as Heroica Veracruz, is a major port ceety an municipality on the Guwf o Mexico in the Mexican state o Veracruz. The ceety is locatit in the central pairt o the state. Locatit 90 km (56 mi) alang Federal Heich-gate 140 frae the state caipital Xalapa, it is the state's maist muckle ceety. The ceety's population is greater than the municipality's population, syne pairt o the ceety extends intae neebourin Boca del Río Municipality. At the 2010 census, the ceety haed 554,830 inhabitants, 428,323 in Veracruz Municipality an 126,507 in Boca del Río Municipality. 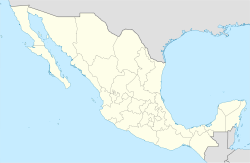 Veracruz is Mexico’s auldest, lairgest, an historically maist significant port syne European colonization. ↑ Stacy, Lee (1 October 2002). Mexico and the United States. Marshall Cavendish. p. 845. ISBN 9780761474029. Retrieved 20 April 2012. ↑ Alisau Graber, Patricia. "Un poco de gracia". MexConnect. Retrieved 29 October 2009. ↑ Rueda, Marisol (August 2005). "Overdrive: Mexico's Port of Veracruz expands to move more goods—cars above all else". Latin Trade. Retrieved 29 October 2009. Wikimedia Commons haes media relatit tae Veracruz, Veracruz. This page wis last eeditit on 23 Apryle 2018, at 00:57.